If you can’t get behind it, don’t do it. Period. Don’t muddle through it. Make a plan, stick with the tasks associated with the project, and go for it. Make time to be in a space to be living in your purpose. Live a life you love, filled with Joy and PASSION, abundance and grace. Thriving emotionally as you journey through life living in the present! I know it may be a crazy thought to think that life can be as big as we make it, and as big as we dream for it to be, but it can be! The work we do doesn’t have to be a drag. It can be fun and rewarding, filled with friendships and strong relationships as we work in unity and without the pressures placed on us in corporate work. Think of the things that are holding you back. List them and make your exit plan. Don’t stay in the status quo unless you are genuinely happy there. Quit your job. Move to a new location. Leave a dying relationship. Put some fire in your current relationship. Buy a home, sell a house, and travel. Start a new business, find your passion. Write a book, start a blog. Go exploring. Take walks, hikes, get out in nature. Explore new hobbies. Take a class or go to a seminar. Life is exciting and we have so much opportunity in the United States. We have one life to live. Will your life be a crazy, fun ride, or will it be routine and boring? Will you be so in love with life that your passion fuels and helps others? Will it light a fire in others to do more, be more, give more? Will you be a beacon of hope for others? Will you sort out what you were put here to do and be? In February of 2017 I quit a 25 year career in sales in the same territory and moved on to network marketing full time. I needed freedom to explore. I wanted time with my aging parents. I was antsy and eager to travel. I had visited Mexico, the Caribbean, and Europe, but there were many places in the United States I wanted to see. My three weeks of vacation each year didn’t allow for me to see the things I want to see. Since quitting I have been getting acclimated to the change of pace in my career. I’m excited about our growth in our networking health and wellness business, and my two-year plan with the business. Being able to share our product from anywhere in the world is such a blessing. There are no constraints on where I work. I am excited to be getting our home ready to Air B&B and starting a dog kennel. This first year of my new life will include road trips across the U.S. The first trip of my new life was last week with a flight into Butte, Montana and to my brothers home along the river in White Hall. 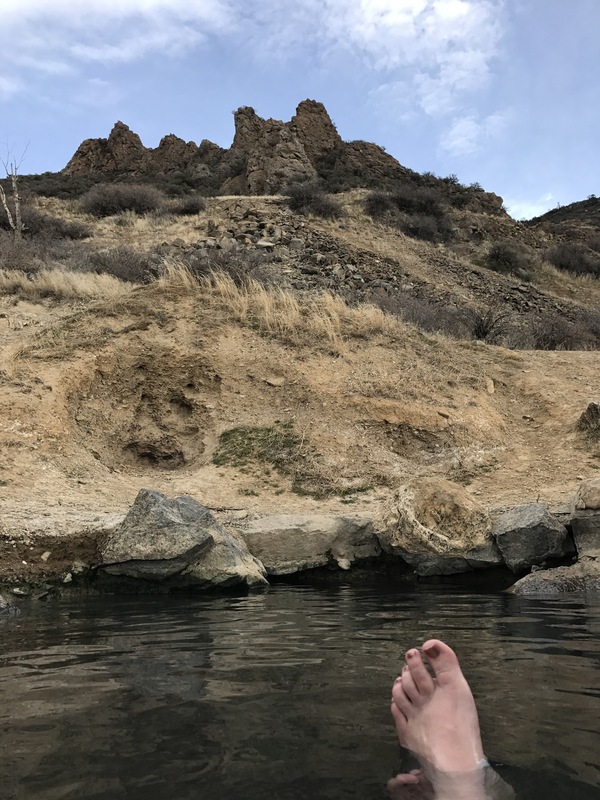 There was so much time to reflect and appreciate the stunning views of the Tobacco Root Mountains while sitting in the hot springs, or in the river every day. A trip to Pony, Montana for dinner and to Bozeman to check out the hot springs there. The drive home took us through Libby Montana, Idaho and into Washington. We stayed at my brother’s condo on the Columbia River and rested to make the drive home. The views were beautiful with multiple shades of green in the landscape. We ate smoked salmon in a beautiful park and took the slow road through Camas, Washington over and down into Oregon. Life is a blessing. It is so amazing the freedom and peace associated with taking the time to take care of myself and sort out what I want to do when I grow up. 45 years young and loving this new chapter in my life. Previous Post Living in Thanks and Praise; Even on our darkest days there is an answer. Next Post Trading Mimosas for Memories!